Creative Nightscapes has been providing customers in Westlake with reliable outdoor lighting design and installation services since 2004. 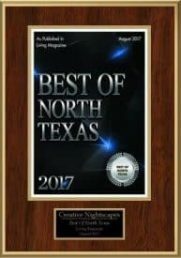 Patrick Cheatham, the owner of Creative Nightscapes, founded the company to help residential and commercial customers enhance their property and improve security. For more than a decade, we have completed over 4,300 outdoor lighting projects with our team of professionals. When you hire us for your home or business, keep in mind that we provide high-quality work without ever outsourcing it to subcontractors. Creative Nightscapes is proud to be a member of the Better Business Bureau and the Association of Outdoor Lighting Professionals. Past customers in the Westlake area have praised our company in online reviews for the impressive work that we do. Our customers have also mentioned the professionalism of our team members when working on projects, from the design phase to the installation process. When you have a feature on your home exterior or on your property that you would like to call attention to, Creative Nightscapes is here to help. 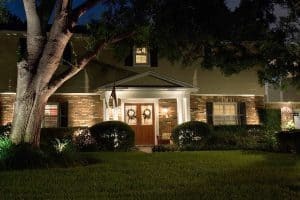 Our landscape lighting services provide homeowners and business owners with a way to highlight certain features and enhance the look of their property overall. With the installation of LED lights for your outdoor lighting needs, you’ll be able to save money on your energy bills while also having a reliable lighting system. Creative Nightscapes offers high-quality LED lighting services for residential and commercial customers. These lights can be used for a wide range of purposes on your property, including garden lighting and poolside lighting. Security lighting is an important feature for homeowners and business owners to have on their property. This lighting helps make your property safer when it’s dark out, lowering the risk of falls and discouraging intruders. Our Creative Nightscapes team offers security lighting design and installation services in Westlake. Patio lights can provide you with the lighting you need to enjoy your patio more throughout the summer months. These lights are available in a wide range of different designs to enhance the look of your patio as well. Creative Nightscapes can help you get the lighting system you need with our patio lighting design and installation services. With poolside lights, you and your family can get more use out of your pool by swimming in the evening and at night. This type of lighting also helps reduce the risk of slips and falls and can be used to give your pool a more relaxing environment. 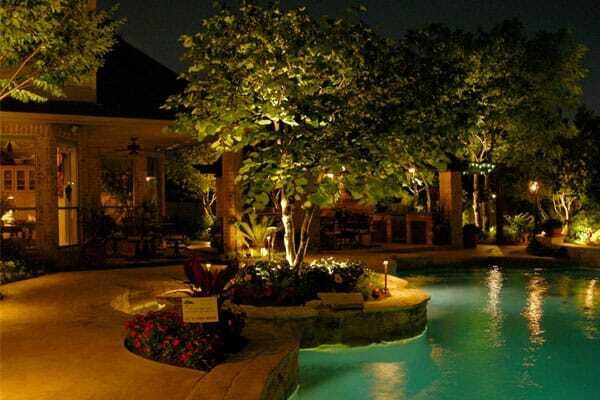 Creative Nightscapes can assist you with designing and installing poolside lighting at your Westlake home. We also offer poolside lighting services for commercial customers. Whether you have a particular flower bed or an ornamental tree or two that you want to highlight, garden lighting can provide you with the results you’re looking for. Creative Nightscapes provides quality garden lighting design and installation services to enhance your residential or commercial property. To learn more about our outdoor LED lighting and other services in Westlake, contact Creative Nightscapes. Our services are also available in nearby towns and cities, including Grapevine, Keller, Roanoke, Southlake, and Trophy Club. Excellent people, service, and competence. Prompt, accurate, priced well, keep their word! Installed Kichler LED outdoor lighting at home in Granada. Placed up lights to accent chimney and various trees in the back yard. Mounted a down light in the eave to highlight the steps from the pool deck to the yard. Set path lights to illuminate walkways and landscape bed near the chimney. Added Kichler LED lighting to existing lighting system at home in Vaquero. Mounted down lights to highlight corner of home near driveway and yard areas below. Set path lights to illuminate Reed landscape bed in back near pool. Placed up lights to accent Crepe Myrtle trees. Installed Kichler LED outdoor landscape lighting at home in Vaquero. Placed up lights to accent facade of home, garage areas, Crepe Myrtles, Evergreen tree, Japanese Maples, Oak tree, Vytex tree, Holly trees, Magnolia, and landscaping. Mounted down lights to illuminate driveway, walkway to cabana, statue, deck, and water feature. Set wash lights to accent low landscaping in front and back yards. Mounted hardscape lights to highlight columns on cabana, steps, and walkway. Removed existing fixtures. Installed Kichler LED outdoor lighting at home in Vaquero. Placed up lights and wash lights to accent Japanese Maples, Oak trees, Crepe Myrtles, Magnolia tree, planters, landscape greenery, and boulders. Removed existing fixtures and installed Kichler LED landscape lighting at home in Vaquero. Placed up lights to accent facade of home, trees, and steps to slide in back yard. Set path lights to illuminate landscape greenery, walkways, and steps. Mounted down lights to highlight patio area, steps to pool, and pool deck. Removed existing fixtures and installed Kichler LED landscape lighting at home in Vaquero. Placed up lights to accent various trees, foliage and landscape, facade of home, and grand entry. Mounted down lights highlighting dry rock creek bed, walkway to entry, garage area parking, stone walkway leading to backyard, walkway behind jacuzzi, steps near cabana, patio on either side of the fountain. Mounted down lights moonlighting yard, gate, and garage entry. Set pathway lights illuminating steps to front entry, areas around pool, and walkway in front of cabana. Performed annual maintenance for a residential client in Vaquero; cleaned and tested all Kichler LED fixtures, replaced 5 broken stakes and the digital timer batteries.